Rosslyn Chapel, originally named the Collegiate Chapel of St. Matthew, is a 15th-century church located in the village of Roslin, Scotland, seven miles from Edinburgh. The chapel is famous both for its decorative art and its mysterious associations with the Knights Templar, the Holy Grail, and the Freemasons. Within the Chapel are its two famed pillars: the Apprentice Pillar and the Master Pillar which, though next to each other, are carved differently. Masonic Architects believe these structures could signify the pillars of Boaz and Jachin, raising the question, is Rosslyn a replica of Solomon's Temple? Rosslyn Chapel was intended to be one of more than 37 collegiate churches that were built in Scotland between the reigns of King James I and James IV (1406-1513). The chapel was founded by Sir William Sinclair of the St. Clair family, a Scottish noble family from Orkney descended from Norman knights and, according to legend, linked to the Knights Templar. The foundation stone of Rosslyn Chapel was laid on St. Matthew's Day, September 21, 1446. 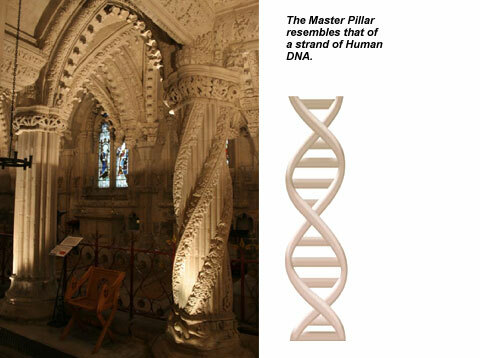 The glorious, superabundant symbolism of the carvings of Rosslyn Chapel is just such a mystery. It is shrouded in symbolism, and secret wisdom just waiting to be realized. It has become the site and source of much speculation and mythology. 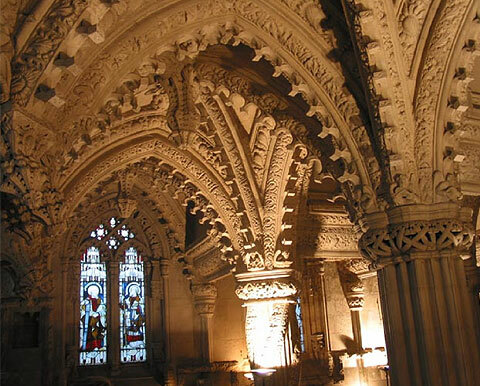 In September 2005 a musical cipher hidden in mystical symbols carved into the stone ceiling of Rosslyn Chapel was reported as being unravelled by Scottish composer Stuart Mitchell. His feat was hailed by experts as a stroke of genius.